Multiple factors contribute to the buildup of plaque inside the arteries. Age, high blood pressure, elevated cholesterol, diabetes as well as family factors can lead to progressive enlargement of plaque, narrowing and stiffening the arteries. This process is called atherosclerosis, commonly known as “hardening of the arteries,” because the plaque buildup thickens the walls of the arteries and narrows the space through which the blood flows, reducing the circulation of blood through the area of the body that gets its blood from the artery. When enough plaque accumulates inside a person’s coronary arteries to reduce or block blood flow to the heart, that person is said to have coronary heart disease, or CHD. It is recommended that people wear clothing that is comfortable to exercise in and avoid strenuous exercise, eating or drinking, and using tobacco products for approximately two hours before the test. It is also recommended that people refrain from applying lotions, oils, or powder because these substances can interfere with a conductive gel used as well as electrocardiographic electrodes. Echocardiography is painless, has no risk, and does not use radiation. Approximately 10 electrocardiographic (ECG) electrodes will be placed on the person’s chest and back, which the physician will use to monitor the patient’s heart function throughout the test. Next, a resting echocardiogram is recorded for later comparison with the stress test. The stress test begins with the patient walking slowly on a treadmill (a stationary bicycle may also be used). The speed and incline of the treadmill increase every 3 minutes, and exercise typically lasts from 5 to 15 minutes. 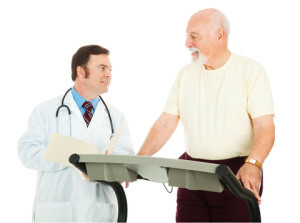 The physician monitors the exercise level, and makes recordings until the person’s heart reaches a maximum predicted heart rate, which is determined by an age-based formula. Because the effects of exercise-induced ischemia will show up in the echocardiogram for only a few minutes, exercise stops as soon as the person’s maximum predicted heart rate is nearly reached and the echocardiography begins immediately. To ensure image quality, a conductive gel is applied to the patient’s chest, and the patient is instructed to lie quietly and exhale fully. Once the test is complete, the physician analyzes the images. Wear comfortable clothes that you can walk and lay on an exam table in. Ladies, please do not wear a one-piece dress. You will be asked to undress from the waist up and a gown will be provided. Please do not wear lotion on the chest area on the day of your test. Wear shoes that you can walk safely on a treadmill in, such as tennis shoes. Bring a list of your medications with you to the test. Your test results will be reviewed by our cardiologist and reported to your physician. Your results will be discussed with you to explain how they relate to your health.